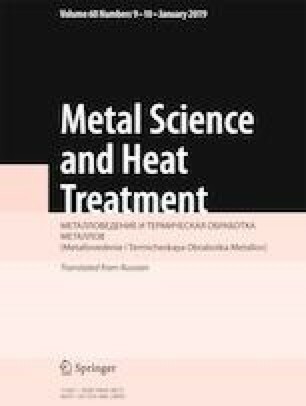 Bimetals produced by explosion welding of titanium alloy VT23 and steel 45KhNM through an intermediate layer of steel 08ps followed by a heat treatment consisting of quenching and tempering are studied. The three-layer composite is subjected to metallographic analysis prior to and after the heat treatment with the help of an optical microscope and a scanning electron microscope equipped with an energy dispersive analyzer. The chemical composition and the hardness of the welded materials and of various regions of the weld are determined, and the changes in these parameters after the quenching and tempering are assessed. Translated from Metallovedenie i Termicheskaya Obrabotka Metallov, No. 10, pp. 36 – 43, October, 2018. The work has been performed with financial support of the Ministry of Education and Science of the Russian Federation (Presidential Grant No. 14.Z56.17.3251-MK).